Jennifer Aniston gives an excellent performance as a woman suffering both physical and mental pain. The hair is stringy, the face scarred, the body constantly in pain as she seeks relief with Percocet and alcohol. Her husband, Chris Messina, has left to fight his own demons, she has been thrown out of a support group and aside from a loveless interlude now and then with her gardener, Manuel Garcia-Rulfo, her main companionship is with her housekeeper Adriana Barraza, who equals Aniston’s performance. The two women represent the imbalance white women and their Mexican help have, particularly in Southern California, though it is only followed through in one quick scene. 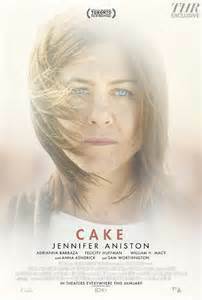 “Cake” contains not only fine performances by Aniston and Bazzaza but also from Felicity Huffman, as a support group leader, along with a cameo by William H. Macy that is too short to have the impact it should plus Sam Worthington as a husband who recently lost a wife, Anna Kendrick, to suicide as she couldn’t deal with the constant pain, with a young boy to raise. The sad thing about “Cake” is that the screenplay by Patrick Tobin, and the director Daniel Barnz, doesn’t even come close to what the actors give them to work with. They play it safe and go with the story of why Aniston is in such pain with a bunch of clichés that are telegraphed way before it has any impact. “Cake” is, what was called in the 1940s, a 4 hankie picture and would have been a star vehicle with say Bette Davis and though Jennifer Aniston equals a performance of that stature unfortunately the screenplay and direction lets them down and we get a 1 hankie picture instead.